Philadelphia celebrated the 100th anniversary of the Declaration of Independence with the Centennial Exposition in 1876. Memorial Hall, which contained the art gallery, was intended to outlast the Exposition and house a permanent museum. Following the example of London's South Kensington Museum, the new museum was to focus on applied art and science, and provide a school to train craftsmen in drawing, painting, modeling, and designing. The Pennsylvania Museum and School of Industrial Art opened on May 10, 1877. (The school became independent of the museum in 1964 and is now part of the University of the Arts). The museum's collection began with objects from the Exposition and gifts from the public impressed with the Exposition's ideals of good design and craftsmanship. European and Japanese fine and decorative art objects and books for the museum's library were among the first donations. The location outside of Center City, however, was fairly distant from many of the city's inhabitants. Admission was charged until 1881, then was dropped until 1962. Starting in 1882, Clara Jessup Moore donated a remarkable collection of antique furniture, enamels, carved ivory, jewelry, metalwork, glass, ceramics, books, textiles and paintings. The Countess de Brazza's lace collection was acquired in 1894 forming the nucleus of the lace collection. In 1893 Anna H. Wilstach bequeathed a large painting collection, including many American paintings, and an endowment of half a million dollars for additional purchases. 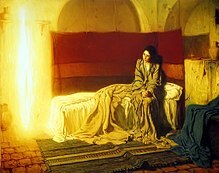 Works by James Abbott McNeill Whistler and George Inness were purchased within a few years and Henry Ossawa Tanner's The Annunciation was bought in 1899. In the early 1900s, the museum started an education program for the general public, as well as a membership program. Fiske Kimball was the museum director during the rapid growth of the mid- to late-1920s, which included one million visitors in 1928—the new building's first year. The museum enlarged its print collection in 1928 with about 5,000 Old Master prints and drawings from the gift of Charles M. Lea, including French, German, Italian, and Netherlandish engravings. Major exhibitions of the 1930s included works by Eakins, Manet, Renoir, Cézanne, van Gogh, and Degas. In the 1940s, the museum's major gifts and acquisitions included the collections of John D. McIlhenny (Oriental carpets), George Grey Barnard (sculpture), and Alfred Stieglitz (photography). 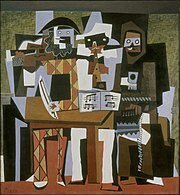 Early modern art dominated the growth of the collections in the 1950s, with acquisitions of the Louise and Walter Arensberg and the A.E. Gallatin collections. The gift of Philadelphian Grace Kelly's wedding dress is perhaps the best known gift of the 1950s. Extensive renovation of the building lasted from the 1960s through 1976. Major acquisitions included the Carroll S. Tyson, Jr. and Samuel S. White III and Vera White collections, 71 objects from designer Elsa Schiaparelli, and Marcel Duchamp's Étant donnés. In 1976 there were celebrations and special exhibitions for the centennial of the museum and the bicentennial of the nation. During the last three decades major acquisitions have included After the Bath by Edgar Degas and Fifty Days at Iliam by Cy Twombly. The City Council of Philadelphia funded a competition in 1895 to design a new museum building, but it was not until 1907 that plans were first made to construct it on Fairmount, a rocky hill topped by the city's main reservoir. The Fairmount Parkway (renamed Benjamin Franklin Parkway), a grand boulevard that cut diagonally across the grid of city streets, was designed to terminate at the foot of the hill. But there were conflicting views about whether to erect a single museum building, or a number of buildings to house individual collections. The architectural firms of Horace Trumbauer and Zantzinger, Borie and Medary collaborated for more than a decade to resolve these issues. The final design is mostly credited to two architects in Trumbauer's firm: Howell Lewis Shay for the building's plan and massing, and Julian Abele for the detail work and perspective drawings. In 1902, Abele had become the first African-American student to be graduated from the University of Pennsylvania's Department of Architecture, which is presently known as Penn's School of Design. Abele adapted classical Greek temple columns for the design of the museum entrances, and was responsible for the colors of both the building stone and the figures added to one of the pediments. Construction of the main building began in 1919, when Mayor Thomas B. Smith laid the cornerstone in a Masonic ceremony. Because of shortages caused by World War I and other delays, the new building was not completed until 1928. The building was constructed with dolomite quarried in Minnesota. The wings were intentionally built first, to help assure the continued funding for the completion of the design. Once the building's exterior was completed, twenty second-floor galleries containing English and American art opened to the public on March 26, 1928 though a large amount of interior work was incomplete. The building's eight pediments were intended to be adorned with sculpture groups. The only pediment that has been completed, "Western Civilization" (1933) by C. Paul Jennewein, and colored by Leon V. Solon, features his polychrome sculptures of painted terra-cotta figures, depicting Greek deities and mythological figures. The sculpture group was awarded the Medal of Honor of the Architectural League of New York. The building is also adorned by a collection of bronze griffins, which were adopted as the symbol of the museum in the 1970s. The museum houses more than 240,000 objects, highlighting the creative achievements of the Western world and those of Asia, in more than 200 galleries spanning 2,000 years. The museum's collections of Egyptian and Roman art, as well as many of its Pre-Columbian works, were relocated to the Penn Museum after an exchange agreement was made whereby the museum houses the university's collection of Chinese porcelain. Highlights of the Asian collections include paintings and sculpture from China, Japan, and India; furniture and decorative arts, including major collections of Chinese, Japanese, and Korean ceramics; a large and distinguished group of Persian and Turkish carpets; and rare and authentic architectural assemblages such as a Chinese palace hall, a Japanese teahouse, and a sixteenth-century Indian temple hall. The European collections, dating from the medieval era to the present, encompass Italian and Flemish early-Renaissance masterworks; strong representations of later European paintings, including French Impressionism and Post-Impressionism; sculpture, with a special concentration in the works of Auguste Rodin; decorative arts; tapestries; furniture; the second-largest collection of arms and armor in the United States; and period rooms and architectural settings ranging from the facade of a medieval church in Burgundy to a superbly decorated English drawing room by Robert Adam. The museum's American collections, surveying more than three centuries of painting, sculpture, and decorative arts, are among the finest in the United States, with outstanding strengths in 18th- and 19th-century Philadelphia furniture and silver, Pennsylvania German art, rural Pennsylvania furniture and ceramics, and the paintings of Thomas Eakins. The museum houses the most important Eakins collection in the world. 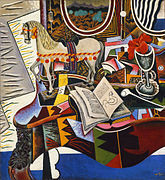 Modern artwork includes works by Pablo Picasso, Jean Metzinger, Antonio Rotta, Albert Gleizes, Marcel Duchamp, Salvador Dalí and Constantin Brâncuși, as well as American modernists. The expanding collection of contemporary art includes major works by Agnes Martin, Cy Twombly, Jasper Johns, and Sol LeWitt, among many others. The museum houses encyclopedic holdings of costume and textiles, as well as prints, drawings, and photographs that are displayed in rotation for reasons of preservation. The museum also houses the armor collection of Carl Otto Kretzschmar von Kienbusch. The Von Kienbusch collection was bequeathed by the celebrated collector to the museum in 1976, the Bicentennial Anniversary of the American Revolution. The Von Kienbusch holdings are comprehensive and include European and Southwest Asian arms and armor spanning several centuries. On May 30, 2000, the museum and the State Art Collections in Dresden, Germany (Staatliche Kunstsammlungen Dresden), announced an agreement for the return of five pieces of armor stolen from Dresden during World War II. In 1953, Von Kienbusch had unsuspectingly purchased the armor, which was part of his 1976 bequest. Von Kienbusch published catalogs of his collection, which eventually led Dresden authorities to bring the matter up with the museum. Each year the museum organizes several special exhibitions. Special exhibitions have featured Salvador Dalí in 2005, Paul Cézanne in 2009, Auguste Renoir in 2010, Vincent van Gogh in 2012, Pablo Picasso in 2014, John James Audubon and Andy Warhol (et al.) in 2016, and Winslow Homer and John Singer Sargent in 2017. In 2009, the museum organized Bruce Nauman: Topological Gardens, the official United States entry at the 53rd International Art Exhibition, more commonly known as the Venice Biennale, for which the artist Bruce Nauman was awarded the Golden Lion. Due to high attendance and overflowing collections, the museum announced in October 2006 that Frank Gehry would design a building expansion. The 80,000-square-foot (7,400 m2) gallery will be built entirely underground behind the east entrance stairs and will not alter any of the museum's existing Greek revival facade. The construction is projected to last a decade and cost $500 million. It will increase the museum's available display space by sixty percent and house mostly contemporary sculpture, Asian art, and special exhibitions. Uncertainty was cast on the plans by the 2008 death of Anne d'Harnoncourt, but new director Timothy Rub, who had initiated a $350 million expansion at the Cleveland Museum of Art, will be carrying out the plans as scheduled. In 2010, Gehry attended the groundbreaking for the second phase of the expansion, due to be completed in 2012. In that phase, a new art handling facility was created on the south side of the building, enabling the museum to reclaim a street level entrance, closed since the mid-1970s, which leads to a 640-foot-long vaulted walkway that extends across the museum and is original to the 1928 building. The north entrance will be reopened to the public as a part of the "core project", which is scheduled for completion in 2020. The core project also focuses on the interior of the current building and will add 90,000 square feet of public space, including 11,500 square feet of new gallery space for American art and contemporary art. In addition, a new space called the forum will be created, along with dining and retail spaces. Said Gehry: "When it's done, people coming to this museum will have an experience that's as big as Bilbao. It won't be apparent from the outside, but it will knock their socks off inside." In March 2017 the museum announced a $525 million campaign. The core project is budgeted at $196 million and will be funded through the campaign. The museum also announced that more than 62 percent of the campaign goal has been met, as of March 30, 2017. The most controversial part of the Gehry design remains a proposed window and amphitheater to be cut into the east entrance stairs. Others have criticized the design as too tame. The Gehry expansion is projected to be completed by 2028. 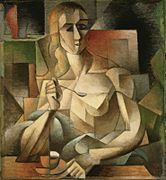 Jean Metzinger, Le goûter (Tea Time), 1911 – André Salmon dubbed this painting "The Mona Lisa of Cubism"
Besides being known for its architecture and collections, the Philadelphia Museum of Art has in recent decades become known due to the role it played in the Rocky films—Rocky (1976) and five of its six sequels, II, III, V, Rocky Balboa and Creed. Visitors to the museum are often seen mimicking Rocky Balboa's (portrayed by Sylvester Stallone) famous run up the east entrance stairs, informally nicknamed the Rocky Steps. Screen Junkies named the museum's stairs the second most famous movie location behind only Grand Central Station in New York. An 8.5 ft (2.6 m) tall bronze statue of the Rocky Balboa character was commissioned in 1980 and placed at the top of the stairs in 1982 for the filming of Rocky III. After filming was complete, Stallone donated the statue to the city of Philadelphia. The Philadelphia Art Commission eventually decided to relocate the statue to the now-defunct Spectrum sports arena due to controversy over its prominent placement at the top of the museum's front stairs and questions about its artistic merit. The statue was placed briefly on top of the stairs again for the film Rocky V and then returned to the Spectrum. In 2006, the statue was relocated to a new display area on the north side of the base of the stairs. The museum provides the backdrop for concerts and parades because of its location at the end of the Ben Franklin Parkway. The museum's east entrance area played host to the American venue of the international Live 8 concert held on July 2, 2005 with musical artists including Dave Matthews Band, Linkin Park and Maroon 5. The Philadelphia Freedom Concert, orchestrated and headlined by Elton John, was held two days later on the same outdoor stage from the Live 8 concert while a preceding ball was held inside the museum. On September 26, 2015, the Festival of Families event, attended by Pope Francis, was held along the Ben Franklin Parkway with musical performances by various acts within Eakins Oval in front of the museum, as well as in Logan Square. On February 8, 2018, the victory parade for the Philadelphia Eagles' win in Super Bowl LII finished upon the museum steps, where players and team personnel gave speeches from a lectern to the large crowd gathered along Ben Franklin Parkway. ^ a b "Philadelphia Museum of Art: Homepage". Philadelphia Museum of Art. Retrieved March 3, 2016. ^ a b c "Centennial Origins: 1874–1876". History. Philadelphia Museum of Art. Retrieved May 21, 2012. ^ a b c d e f g h i "Search Collections". Philadelphia Museum of Art. Retrieved February 25, 2016. ^ a b Robert T. Rambo (n.d.). "2017 Annual Report" (PDF). Philadelphia Museum of Art. p. 19 (of PDF file). Archived (PDF) from the original on March 28, 2018. Retrieved March 28, 2018. Admission income of $5.4 million and attendance of 793,000 were essentially at the same levels as 2016. ^ "Philadelphia Museum of Art: About Us: Administration - Board of Trustees". Philadelphia Museum of Art. Retrieved March 3, 2016. ^ a b c "Philadelphia Museum of Art: About Us: Our Story: 1920-1930". Philadelphia Museum of Art. Retrieved March 14, 2016. ^ a b "About Us: Administration". Philadelphia Museum of Art. Retrieved February 25, 2016. ^ "About Us : Our Story : Perelman Building - Renovations and Expansion". Philadelphia Museum of Art. Retrieved March 3, 2016. ^ "About Us : Our Story : Perelman Building - Galleries & Spaces". Philadelphia Museum of Art. Retrieved March 3, 2016. ^ "Visiting : Plan Your Visit : Historic Houses". Philadelphia Museum of Art. Retrieved December 18, 2017. ^ a b "On View: Past Exhibitions". Philadelphia Museum of Art. Retrieved February 25, 2016. ^ a b "On View: Current Exhibitions". Philadelphia Museum of Art. Retrieved February 25, 2016. ^ a b "Philadelphia Museum of Art :: Benjamin Franklin Parkway, Philadelphia, Pennsylvania, United States". Glass Steel and Stone. Archived from the original on May 11, 2013. Retrieved January 28, 2014. ^ a b c "The Early Decades: 1877–1900". philamuseum.org. Philadelphia Museum of Art. Retrieved October 22, 2018. ^ "About Us: Our Story: 1900-1910". philamuseum.org. Philadelphia Museum of Art. Retrieved March 27, 2018. ^ "About Us: Our Story: 1930-1940". philamuseum.org. Philadelphia Museum of Art. Retrieved March 27, 2018. ^ "About Us: Our Story: 1940-1950". philamuseum.org. Philadelphia Museum of Art. Retrieved March 27, 2018. ^ a b c "An Overview of the Museum's History". philamuseum.org. Philadelphia Museum of Art. Retrieved March 27, 2018. ^ Tatman, Sandra L. "Abele, Julian Francis (1881 - 1950) Architect". philadelphiabuildings.org. The Athenaeum of Philadelphia. Retrieved March 24, 2017. ^ "Julian Francis Abele (1881-1950): First African American graduate of the School of Fine Arts". design.upenn.edu. University of Pennsylvania School of Design. Retrieved March 24, 2017. ^ "Galleries and Gardens: Discover blossoming works of art in Philadelphia's green spaces". With Art Philadelphia. Retrieved March 28, 2016. ^ Samuels, Tanyanika (June 2, 2011). "Bronx street rename for borough's own sculptor Carl Paul Jennewein". The New York Daily News. p. 31. Retrieved March 28, 2016. ^ Lowey, Nita M. "New York: C. Paul Jennewein, Sculptor (Local Legacies: Celebrating Community Roots - Library of Congress)". Retrieved March 28, 2016. ^ Jean Sutherland Boggs records, from Philadelphia Museum of Art. ^ Evan H. Turner records, from Philadelphia Museum of Art. ^ "Arnold H. Jolles Records", Philadelphia Museum of Art Archives, Accessed online April 16, 2017. ^ Henri Gabriel Mareau Director records, from Philadelphia Museum of Art. ^ "Our Story: 1920 – 1930", Philadelphia Museum of Art, Accessed April 16, 2017. ^ Langdon Warner records, from Philadelphia Museum of Art. ^ Edwin Atlee Barber records, from Philadelphia Museum of Art. ^ Dalton Dorr records, from Philadelphia Museum of Art. ^ "Philadelphia Museum of Art: About". ARTINFO. 2008. Archived from the original on December 10, 2008. Retrieved July 29, 2008. ^ "Frequently Asked Questions: What does the Museum’s collection include?" (archive). philamuseum.org. Philadelphia Museum of Art. Retrieved March 27, 2018. 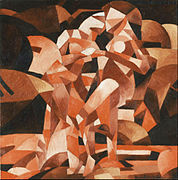 ^ "Philadelphia Museum of Art - Information : Press Room : Press Releases : 2004". Philamuseum.org. September 27, 2004. Retrieved January 28, 2014. ^ "PMA press release". Philamuseum.org. December 16, 1999. Retrieved January 28, 2014. ^ Armor Collection at arthistorians.info. ^ "On View: Past Exhibitions: 2005 - Salvador Dalí". Philadelphia Museum of Art. Retrieved March 28, 2016. ^ "On View: Past Exhibitions: 2009 - Cézanne and Beyond". Philadelphia Museum of Art. Retrieved March 28, 2016. ^ "On View: Past Exhibitions: 2010 - Late Renoir". Philadelphia Museum of Art. Retrieved March 28, 2016. ^ "On View: Past Exhibitions: 2012 - Van Gogh Up Close". Philadelphia Museum of Art. Retrieved March 28, 2016. ^ "On View: Past Exhibitions: 2014 - Picasso Prints: Myths, Minotaurs, and Muses". Philadelphia Museum of Art. Retrieved December 22, 2017. ^ "On View: Past Exhibitions: 2016 - Audubon to Warhol: The Art of American Still Life". Philadelphia Museum of Art. Retrieved December 22, 2017. 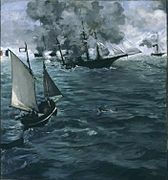 ^ "On View: Past Exhibitions: 2017 - American Watercolor in the Age of Homer and Sargent". Philadelphia Museum of Art. Retrieved December 22, 2017. ^ "Bruce Nauman: Topological Gardens", Philadelphia Museum of Art, Accessed May 14, 2017. ^ Pogrebin, Robin (October 19, 2006). "Philadelphia Museum Job Sends Gehry Underground". New York Times. 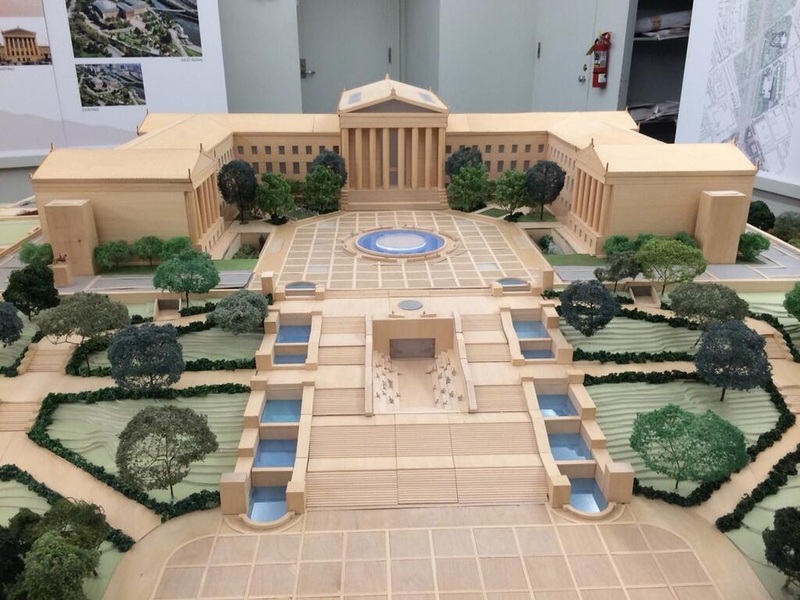 ^ "Frank Gehry's Quiet Intervention at the Philadelphia Museum of Art", Plan Philly, Accessed May 14, 2017. ^ Romero, Melissa. "5 Ways the Philadelphia Museum of Art will look different in 2020", Curbed Philadelphia, Accessed May 14, 2017. ^ a b c d Cascone, Sarah. "Philadelphia Museum of Art Aims to Raise $525 Million for Frank Gehry Designed Expansion", Artnet, Accessed May 14, 2017. ^ Associated Press (November 22, 2011). "Philly museum starts Gehry expansion". USA TODAY. Retrieved May 11, 2012. ^ Gehry architectural model, from Philadelphia Magazine, June 26, 2014. ^ Heller: "If you're going to hire Gehry, Let's do Gehry," Philadelphia Magazine, August 11, 2014. ^ Gehry section through museum, Philadelphia Magazine, July 2, 2014. ^ The Rocky Statue and the Rocky Steps visitphilly.com, accessed June 17, 2011. ^ Avery, Ron. "Philadelphia Oddities - Rocky Statue". Independence Hall Association. Retrieved March 28, 2016. ^ Holzman, Laura (2013). "Rocky". Encyclopedia of Greater Philadelphia. Retrieved March 28, 2016. ^ "Festival of Families" (archive). worldmeeting2015.org. Retrieved March 27, 2018. ^ Jim Yardley and Daniel J. Wakin (September 26, 2015). "At Independence Hall, Pope Offers a Broad Vision of Religious Freedom" (archive). nytimes.com. Retrieved March 27, 2018. ^ "The Pope's Visit to Philadelphia" (archive). visitphilly.com. Retrieved March 27, 2018. ^ Eric Levenson and David Williams (February 8, 2018). "Eagles fans flock to Philadelphia streets for Super Bowl parade" (archive). cnn.com. Retrieved March 27, 2018. 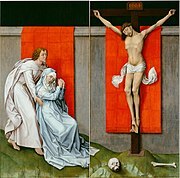 Wikimedia Commons has media related to Philadelphia Museum of Art.